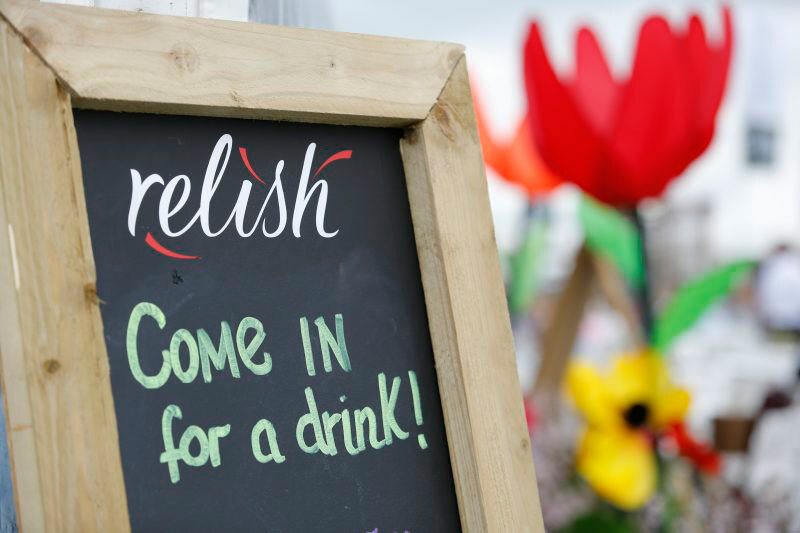 We have all survived the recent rush of back to back festivals Badminton Horse Trials and The RHS Malvern Spring Show – where the Relish team run Members Enclosure restaurants and café’s alongside public areas. At both shows each area is run very differently – at BHT the Members Enclosure offers a seated seasonal buffet meal, all freshly prepared on site by our talented chefs! This year they had a selection of cold salads, tarts and salmon alongside some delicious locally sourced meats. Adjacent to the restaurant is the more relaxed area where Members can enjoy the large TV screens reporting the day’s action. Within this Café we also offer some food pop up stalls – deli salad bar, sandwiches, snacks and of course our famous coffee from Café Direct with our tasty cakes. We also host an on site deli bar accessible to all. Our main prep kitchen is situated in the middle of both the areas so we are able to prepare and distribute food very quickly to all the locations. This year at Badminton we were joined in the public area by the amazing Baz and Fred, where they served their famous pizza to a very happy local audience. During both shows, we offered site tours to some of our regular suppliers and new business contacts so they could see where the magic happens, they are always very surprised by how big the field kitchen is and the scale of planning and operations that go into each event to achieve such varied and delicious meals from breakfast to dinner in the middle of a field! During Badminton, we also hosted The Pig and Whistle Pub with Wadsworth – the bar is busy from lunch and into the evening where Funkty Dumpty the ultimate live funk, soul and pop function band were playing! Most people we spoke to during the horse trials were there for family tradition, which is always nice to see the whole family getting involved at such a prestigious event! After spending a week at Badminton the whole team packed all the equipment up and hot footed it over to Malvern, Three Counties Showground, for The Spring Show. The flower show is very different to Badminton, following a much more relaxed pace. However each event is equally as prestigious with this being the pre cursor to the world renowned Chelsea flower show. This show is also one for a bargain, with discounted garden furniture and accessories, variety of different plants and flowers and regional food produce like cheese, fruit and breads. We loved the idea of a pop up van so this year we invited ‘Bertie the Van’ run by Frobishers Cordials, who were promoting new products and offering yummy tasters and of course Campervin (wine bar)! The most popular destination at The Spring Show was the artist’s gardens – this is where the designers have created a pop up garden which they have been planting and developing for months before the show opens. These gardens are all unique and very beautiful – and if you are a Ground Force fan you may also catch a glimpse of Alan Titchmarch. Even though it’s been a manic two weeks with not much rest – it is what everyone works hard towards all year and we all love being part of each event! When I asked the team on the catch-up day back in the office ‘any funny stories then?’ They all laughed and then there was silence… which normally means ‘yes’ but I don’t want you to make it public! Proudly powered by WordPress | Theme: relish by Arthur Rigley an underscores starter theme creation.